Why Solar Edwards solar hot water? What solar hot water system is right for me? Solar hot water – what rebates are available? Hot Water heating is the largest single source of greenhouse gas emissions from the average Australian home, accounting for around 25% of home energy use (excluding the family car). 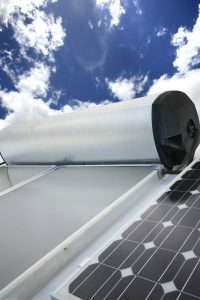 The Sunshine Coast Solar Centre is the exclusive Sunshine Coast distributor of the Australian designed and manufactured Solar Edwards solar hot water systems and was recently awarded the prestigious “Sales Excellence Award” for 2010. By installing an Solar Edwards stainless steel solar hot water system you can save between 50 and 90% of your hot water energy costs and reduce your household greenhouse gas emissions by around 25%. Using an Solar Edwards solar hot water system to provide your hot water needs therefore makes good financial and environmental sense.